The 2nd Clover Valley Brownies worked on the Key to Arts this spring, which requires the girls to make a blanket/quilt for charity. As a quilter, their Guider, Dawn Penner, thought it would be easier to teach the girls to quilt instead of teaching them how to knit. 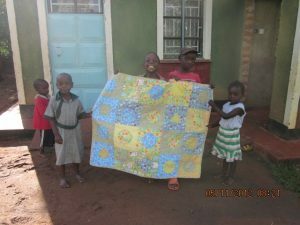 The children who received the quilt are in Bungoma, which is close to Lake Victoria in West Kenya. As the girls were starting to work on the Key, a family member informed Guider Dawn that she would be going to Africa this spring and that she would be visiting children who had lost their parents. This resourceful Guider saw an opportunity for her Brownies to learn that they had the ability to affect other children’s lives and to connect them to a part of the world they might never visit. The Brownies managed to complete the quilt the week before Dawn’s niece, Jessica, left on her trip and she was able to take it along as a donation. Jessica reported the children were so surprised that Canadian children would be thinking of them.